How can the visitor take in the whole product display within a few seconds? The main challenge is to completely renovate an empty interior space into a pharmacy store. The wood vertical elements of the custom shelving display, follow a parametric variable curve that is formed by designing a curved visual field for the visitor that relates to the product display as it unfolds. Therefore, the specific method of contextualising the elements targets the whole perception of the visitor, who can rapidly see all the products on display. The primary intention is to create a changing scene, where as each element is contextualised, together they direct the eye and the visitor's movement along the product display of the pharmacy store. The scene is linearly developed as a changing, continual system that functions as a perceptual boundary between the private and public spaces. Thus, the scene simultaneously separates and unites the laboratory, the storeroom, and the washrooms with the main space of the pharmacy shopping area. 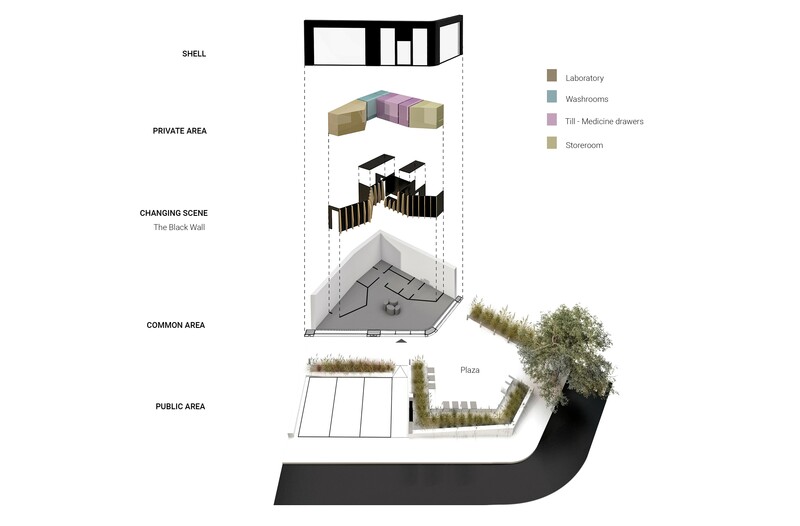 The objective is to create a functionally unified space, that does not interrupt the overall spatial continuity between the outer, public space of the shopping area and the private workspace of the pharmacists. The design principles have resulted in benefits to the customers. More specifically, the pharmacy clientele has increased, as have the sales of the full product range through the originality of the changing scene design. The time spent in the shop space by customers has also increased, thanks to the immediate functional and visual continuity of the space. The pharmacy floor is covered with waterproof resinous cement to avoid erosion by tinctures and acids, while special layouts for placing medicine drawers that can be reached from the till have also been designed. Likewise, in the laboratory, stainless steel sinks and refrigerators for medicines and vaccines have been used, specific places have been designed to place equipment such as high-accuracy scales, volumetric tubes, magnetic heated baths as well as conical, heat-resistant vials.